1. First and foremost, it shows them the ROI. Before you run your campaign, you and your client need to agree upon KPIs (key performance indicators) and define what success looks like so that everyone is on the same page regarding what actions to take based on specific results. Cost per 1,000 people reached – As opposed to the traditional advertising metric of CPM (cost per 1,000 impressions), which is at best an educated guess, Facebook can tell you the actual number of people reached by your ad. This metric is a good way to show the effectiveness of your audience targeting, how well your bid performed in the ad auction, and the ROI on your budget. Frequency - An estimate of the amount of times someone saw your ad, measuring frequency is a good way to build awareness and keep your ad top-of-mind. Of course, you don’t want to oversaturate your audience with your message, which is another good reason to keep an eye on this metric. 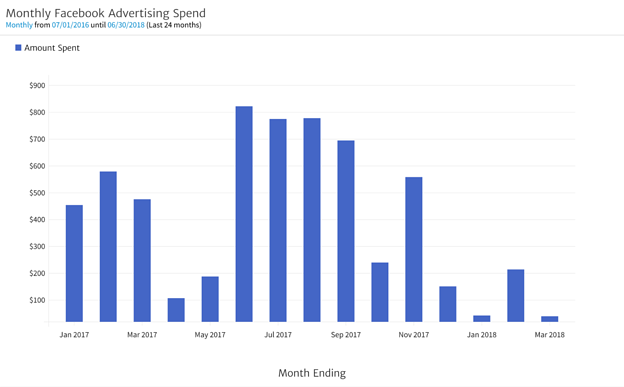 Amount spent - This shows you how much you’ve spent over the course of your ad campaign at any given time. Obviously, this one is important to ensure you’re spending within your budget. For each type, you can see how much you’re spending per lead. Depending on the type of campaign your client is running, you may find one or more of these metrics relevant. For example, if your client is running a lead ad, you’ll want to measure leads from that ad as well as organic leads, but website leads won’t be as relevant because you want the contact to take action on the Facebook ad lead form, rather than directing them to a lead form on your site. The relevancy of click metrics to your client depends on their end goals and KPIs. For example, if you’re trying to drive traffic to your client’s website, you’ll want to track CTA clicks as well as clicks to your company name or logo (assuming you’ve linked back to your site with these). If your client’s main goal is to generate awareness, they may be more interested in seeing how many people shared, commented, and/or liked their ad. Clickthrough rate – While clickthroughs are the total number of times people clicked on your ad, clickthrough rate tells you how many times people clicked on your ad compared to the number of times they saw it. This is calculated by dividing link clicks by impressions. As with measuring email clickthrough rate, this is a great metric to track engagement. A low clickthrough rate means that many people who saw your ad weren’t driven to click on it, so you will need to retool your messaging, possibly conducting tests with different ad types, to find the one that most engages your audience. 2. Transparent reporting builds the trust needed for a long-term agency-client relationship. One of the best experiences you can have working with a client is dedicating significant time and resources to a project that becomes a resounding success. There’s nothing like it, and when the client is happy, everyone’s happy. But what if the fruits of your labor aren’t what the client needs? What if you don’t meet your goals? While this scenario is far from ideal, you can still take those lemons and make lemonade, so to speak. First, if you’re frequently reporting results, you’ll find out what’s not working sooner rather than later. And trust me, the opposite of that glorious feeling of success I mentioned earlier is the feeling of cold dread that comes when you realize that a campaign you haven’t paid attention to is failing and has been failing for a while, and you’re going to have to break the news to your client. This is a fantastic opportunity to show your client that you are their partner, not just a vendor providing a tool or service. Make it a brainstorming session, kicking things off with some of your ideas. Use your expertise to guide them toward corrective actions, implement those actions ASAP, and keep swinging. Reasonable clients don’t expect perfection, but they expect honesty, quick action, and open communication. Show them that you are a trusted advisor, and you open the door to a long, fruitful partnership. 3. Monthly Facebook reporting keeps you in front of the client and alert to new opportunities. Clients need to hear from you regularly. Even if they only hired you to do a specific project, you can turn it into a retainer by proving that you aren’t a one-trick pony. When you’re delivering results, take the opportunity to provide value outside of showing you can successfully run a Facebook ad campaign, and let the data guide you. 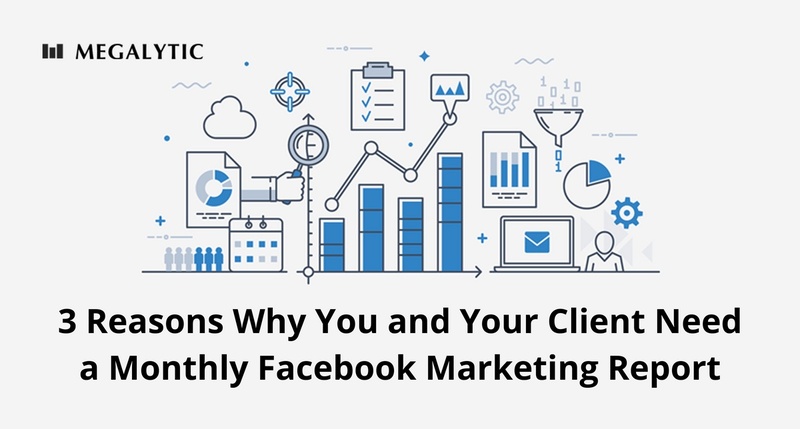 These are just a few ways you can help your client capitalize on the success of their Facebook ad campaign and improve their relationship with your agency, all stemming from your monthly report. It’s hard to overstate the impact that digital platforms have had on marketing and advertising. For most of the 20th century, advertisers used a “spray and pray” method of getting the word out about their products and services. In the B2B publishing world, for example, sometimes you’d pay to include your company name in print ad “bingo cards,” postcard-sized magazine inserts where readers could check a box to express interest in your offerings, hand-write their contact info, and mail it to you. Other times, maybe you wired a news release and/or faxed it (yes, faxed it) to the broadest audience possible, crossing your fingers that someone, somewhere would do a write-up. As wildly imprecise as they were, we still used these methods well into the 2000s because digital platforms were still in their infancy. Thanks to the exponential growth of Facebook and other social platforms, the pendulum has swung in the opposite direction. Now, sometimes there’s so much data available that it can feel overwhelming. It’s your job, as your client’s agency, to make it digestible and actionable. And if creating monthly reports for all your clients seems like a daunting task, the Megalytic reporting tool can help. In particular, check out the sample Facebook template here.